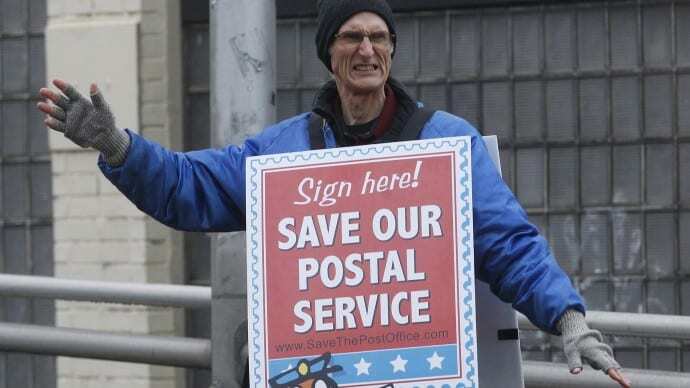 With finances waning and post offices closing, a small group of postal workers, along with supporters, travelled to Washington Monday to stage a hunger strike in protest of Congress’ failure to approach the issue. The 10 strikers, made of current and former postal workers, pledged to take part in a four-day hunger strike, saying that desperate times call for desperate measures. In July, the U.S. Postal Service plans to begin closing or consolidating 48 mail processing plants. By the end of the consolidation process at the end of 2014, 229 plants will be reorganized and 28,000 jobs will be lost. The strikers maintain that their unions have not done enough to help prevent the state in which the Postal Service currently finds itself in. “Their whole game is to lobby the Congress members, but they’ve been doing that for a year and half and it’s not gaining much traction,” Dodge told National Public Radio. On Wednesday, the strikers picketed outside the Washington Post’s office in order to show their criticism of the newspaper’s editorials about the U.S. Postal Service. In an April 14, the Washington Post Editorial Board published an opinion piece entitled, “The time for real postal reform is now.” In the piece, the editorial board states that the decline in Postal Service revenue is due to technology, a declining amount of mail and high labor costs of postal employees. “If the postal service were a private company, its shareholders would be clamoring for it to get on with the restructuring, pronto. But USPS answers to Congress, which gets lobbied by ‘stakeholders’ – i.e., special-interest groups – that benefit from the status quo,” the editorial staff writes. However, the striking postal employees made clear to spread the message that Congress’ inaction has led the U.S. Postal Service to continue to decline. Postmaster General Patrick Donahoe said at a press conference in June that if the Postal Service does not cut costs and Congress fails to act, that the USPS will be in a similar situation as Greece. Although he clarified that he was serious about the implications a lack of action would create, he did not think the Postal Service was on the verge of default or bailout. According to a report, the Postal Service lost $5.1 billion in revenue last year. A congressional mandate that would prefund retirement health care benefits was cited as one of the reasons for the decline. The congressional mandate requires that the Postal Service prefunds health care benefits for future retirees. The Postal Service has stated that it does not have funds to pay the $5.5 billion payment that will be due on Aug. 1 or the $5.6 billion payment due Sept. 30. Unions say the health care payments are the major reason for the financial issues the service is encountering and that the mandate should be eliminated by Congress. Jamie Partridge, a retired letter carrier who worked in Portland, Ore. for 27 years, took part in the hunger strike. “Congress Created the problem, Congress can fix it,” said Partridge. Additionally, postal workers state that closing and consolidating sites will lead to a delay in service which will in turn lose the Postal Service even more customers. “We’re just frustrated. We’re indignant, we’re outraged, we’re here to shame Congress into doing the right thing. We’re willing to suffer, to go on a hunger strike in order to show our indignation,” Partridge said. This entry was posted on July 2nd 2012 at 4:49pm/16:49 and is filed under Live News Column 1, Politics. You can follow any responses to this entry through the RSS 2.0 feed.